Three of Carlsbad’s finest parks are in the process of getting their master plans updated and now is the time to share your thoughts. 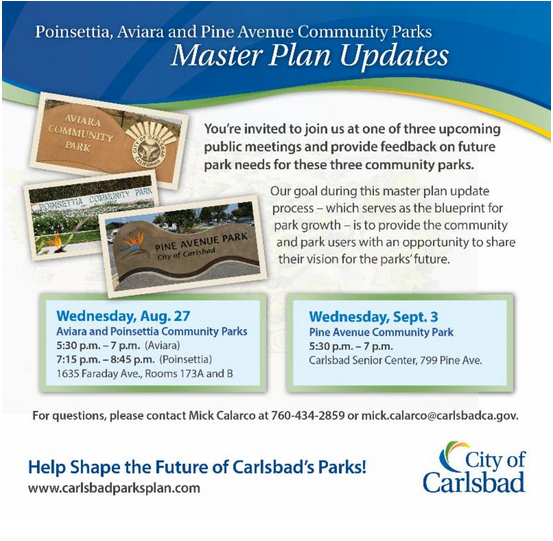 On Wednesday, August 27, 2014 the City will discuss plans for Aviara and Poinsettia Parks in rooms 173 A and B at the City Offices at 1635 Faraday Ave. in Carlsbad. Then on Wednesday, September 3, 2014, Pine Avenue Community Park will be discussed in the Carlsbad Senior Center at 799 Pine Ave. Both meetings begin at 5:30 PM. Please attend one of these meetings to give your input and opinions about the future of Carlsbad public parks. If you feel that Community Gardens should be part of our city parks, this is the time and place to make your voice heard. Can’t attend? Please email Mick.Calarco@carlsbadca.gov to share your thoughts. The Boys & Girls Clubs of Carlsbad are happy to announce that longtime community volunteers and advocates Ann and David Kulchin will serve as Honorary Chairs of Boys & Girls Clubs of Carlsbad’s 33rd Annual “The Greatest Club on Earth!” Gala. Dave Kulchin joined the Club’s Board of Directors in June 1999. He wore many hats during his tenure, including Board President. He currently holds the highest honor – Lifetime Honorary Board Member – as a result of his significant contributions to the Club. 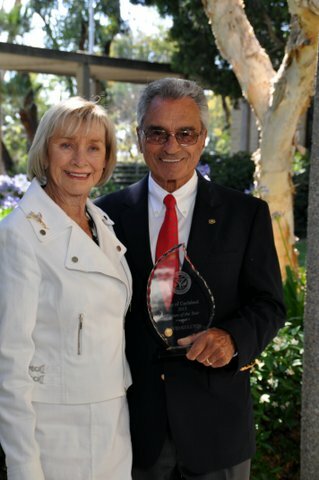 He and his wife, former Carlsbad Councilmember and Mayor pro-tem Ann Kulchin, raised close to $1.2 million to build a new branch of the Boys & Girls Club in Bressi Ranch. This state-of-the-art Clubhouse opened in 2011.